COURAGE HAS A NAME ~ Maya-Ray Cross. Interviewed by Chris Macdonald andStorme Sparkes. | DBP MAGAZINE ONLINE The World's Best Free Whitewater Publication. COURAGE HAS A NAME ~ Maya-Ray Cross. Interviewed by Chris Macdonald andStorme Sparkes. 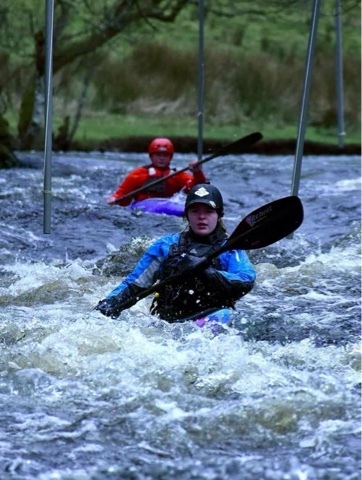 Maya-Ray Cross, Mayo to her friends and fans around the world, is an avid young whitewater paddler from the UK who lives in Wigan, spending lots of time in Chester and North Wales. Tomorrow is her fifteenth birthday!! Cheers to you, Mayo! She loves getting out on the water as much as possible with her friends. 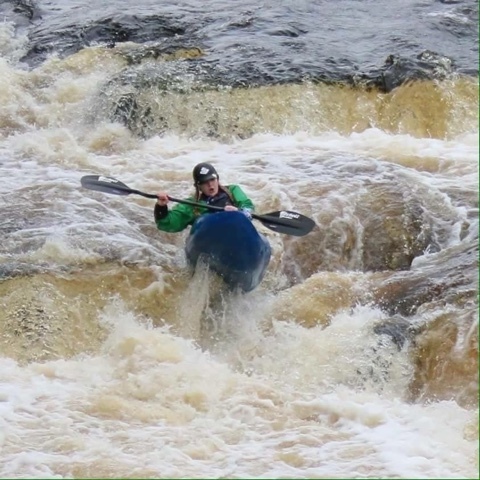 Her family is very supportive; with their encouragement her many years of hard work have led to paddling Grade 4 rivers, and sharing her love of the sport by participating in coaching. 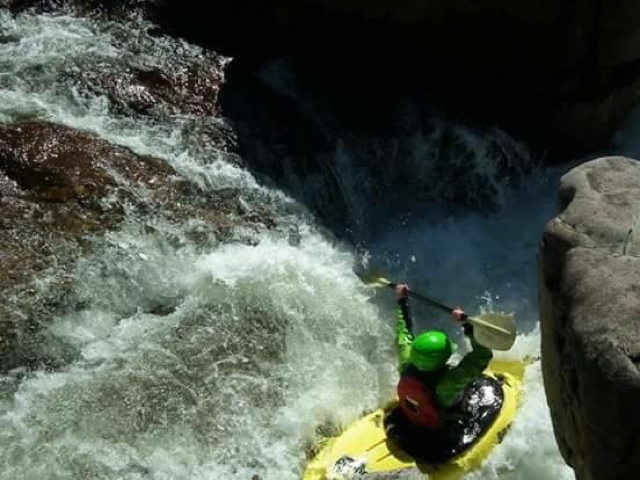 She has accomplished all of this at a relatively young age, a nice start to a stellar whitewater resume. But what makes her truly amazing, an inspiration to people – paddlers and non – is that she has accomplished all of this while coping with many health issues. Mayo has chronic pain because of Ehlers Danlos Syndrome, a genetic condition that affects the collagen, in some cases all through the body. It can cause dislocations and subluxations of joints. Mayo dislocates shoulders, knee caps, fingers, thumbs, wrists, toes, and her hips are dodgy too. She finds walking painful and difficult as she falls lots. She is constantly covered in bruises due to her condition, which at times are very painful. Roadside selfie that was taken yesterday after Mayo got off the river with a subluxed shoulder. Still smiling though! In addition she has Dyspraxia, an umbrella name for lots of different illnesses which for Mayo include anxiety, irrational fears, and lots of other stuff. She also has a very rare vascular condition called Blue a Rubber Bleb syndrome. It causes raised painful lumps of damaged blue veins. She also had spinal surgery several years ago which seems to have had an adverse effect on the nerves in her right leg. This too can make kayaking more difficult for her, but still she remains undeterred. 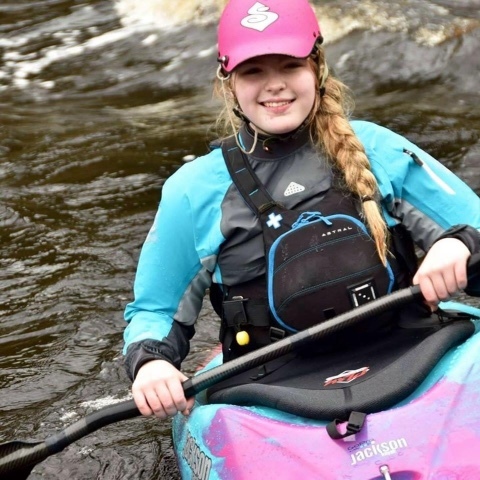 DBP MAGAZINE ONLINE celebrates this courageous young lady’s birthday with an interview conducted by two other bright young paddlers from the UK, both Admins and frequent contributors to the magazine, Chris Macdonald and Storme Sparkes. These two teenagers have also had to contend with challenges on and off the water, and really related to Mayo when introduced. All three of them share much in common, and hope to paddle together soon. 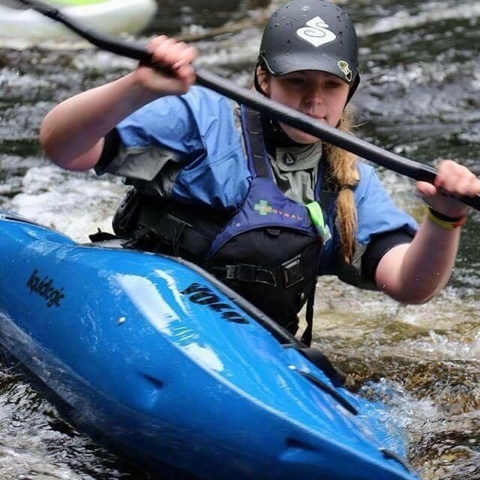 Storme, based in Leicester and paddling mainly at Nene and HPP, has recently taken up coaching while battling her own health issues which can make kayaking very difficult. “I’ve not always had the best support as I was seen as a ‘mardy little girl’ when having panic attacks, but now people understand a lot better. I’m on meds for it now which really helps, but there’s been some dark days on the river.” Storme treats her panic disorder, anxiety and depression, as well as Weil’s Disease, and paddles with her club as much as she can, fully enjoying the festival season in the UK. All three of these youngsters embody the word Courage. 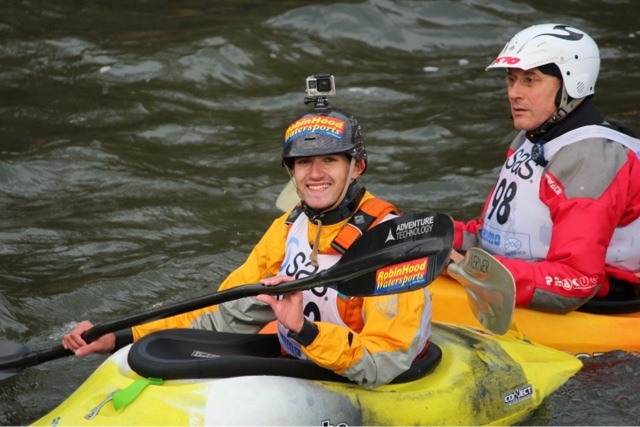 CHRIS: What inspired you to get into paddling? MAYO: I started paddling when I was around 7. We saw a group paddling on a pond at a local country park open day. I was too late to join in that day. We asked if there was a local club and we went along to the next session. I was hooked the first time I paddled and I have never stopped since. CHRIS: What challenges did you face when starting paddling apart from pain due to your condition? MAYO: Apart from my pain it would have to be paddling in a straight line. I found it really difficult. We didn’t have a diagnoses at the time, but found out later that I have Dyspraxia as well as Ehlers Danlos Syndrome. Dyspraxia affects the way I learn and my coordination, amongst lots of other things. I had an amazing coach who realised I had issues and that I am more of a visual learner. He really helped me to get going and got me through my first two star awards and Paddle power. MAYO: I prefer to do rivers where the access points and egress points are as accessible as possible by car so that I don’t have far to walk. I hate having to rely on other people to help me and carry my boat, but sometimes I have no choice. I like rivers that can be walked down the side of, like the Upper Tryweryn, or where my parents can follow in the van. I always carry my own first aid kit just in case and I let everyone in the group know about my condition. I have handed out lots of EDS Uk leaflets. I have lots of support when needed and I like to paddle with the same people, including my best bud Stu. I use a crank shaft paddle which is easier on the wrists and shoulders than a straight shaft. I also have a Astral BA that is a side opener and easier to get off in case of dislocations. STORME: Do people rescuing you (Wallace!) have to make any special considerations? MAYO: To be honest, I haven’t taken a swim in a while, even when I smashed my teeth in I self rescued by rolling back up. I’m probably due a swim. There aren’t really any special considerations when rescuing. Just do what needs to be done, then deal with any issues once everyone is safe. My parents are always close by if needed to deal with any issues. I do bleed a lot which can be quite off putting, and I bruise very easily so things tend to look very bad if I get a bang or a cut. Which is quite often as I fall a lot!! I am much safer in a boat than walking. Things are a little different at the minute as we need to keep checking my nasogastric tube hasn’t moved and I need to check it is still in my stomach. STORME: What do your doctors, friends and family think of you paddling with your conditions? After Weil’s disease much of my family wanted me to give it up. 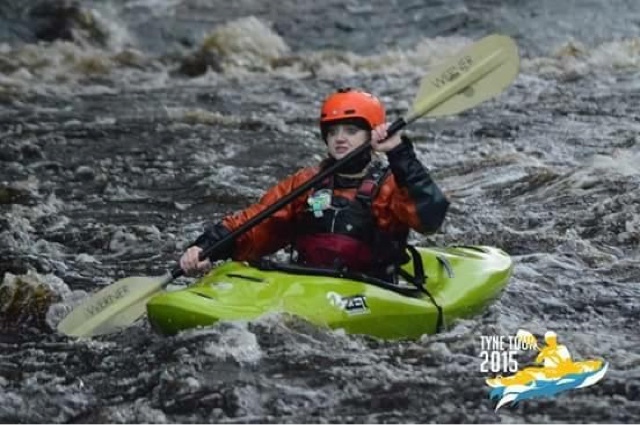 MAYO: My doctors are really supportive and encourage me to use kayaking as my therapy. It helps to build your muscles up, which should make me stronger, resulting in less dislocations. My physio is behind me all the way!! It also helps my mood and gives me something to look forward to. Most of my friends are paddlers and fully support me. My non paddling friends think I am crazy!! My family back me 100% and have told me as long as I say that the pleasure I get is worth the pain I get, they will help me to keep doing what I do. Life is for living!! 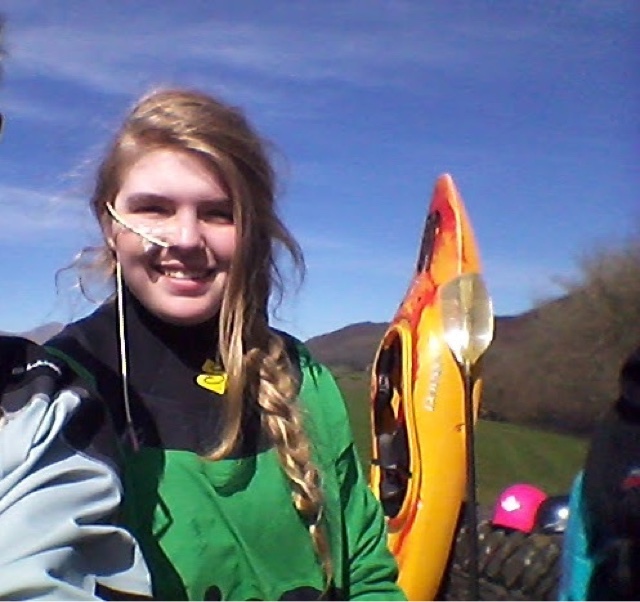 CHRIS: What do other paddlers on the river think of you when they find out you have Ehlers Danlos Syndrome? MAYO: At first they freak out a little because they don’t understand my condition. The people who know and understand are so supportive, which is amazing. I suppose it is a bit scary for people when I tell them I dislocate joints easily. STORME: Does paddling help or hinder your anxiety? MAYO: It can hinder my anxieties depending on what kind of day I am having. Sometimes I’m on a good day and everything is great and I will paddle that river with no issues. 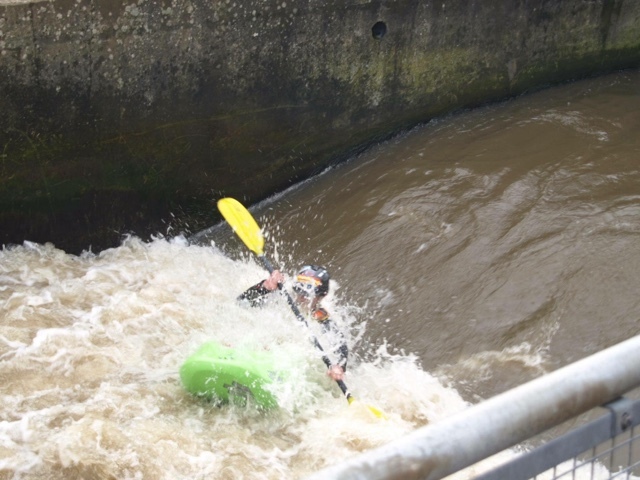 I also find if I am leading someone down, I cope a lot better as my mind is on the other person making sure they are ok. On other days I can really struggle to even get on the water and find the simplest things daunting even if I have done them before. CHRIS: Why did you get into coaching? MAYO: I’ve assisted with coaching for a while; I just like helping people and watching them enjoy something I love. I also love it when people come and ask me about something, like to see if they are doing a particular stroke right. STORME: How do you overcome difficulties (such as walking) when coaching? MAYO: I assist with coaching mostly in the pool so walking isn’t as much of an issue. I find being in the water really helpful to take the weight of my joints so I try to coach from in the water as much as possible. When outside I try to coach from my boat as much as possible but when I do have to walk I tend to use my paddle to support me. My mum goes mad as it’s expensive to use as a walking stick!! CHRIS: What would you do if you weren’t a paddler? MAYO: I would probably be a geek, with school, homework and more school. 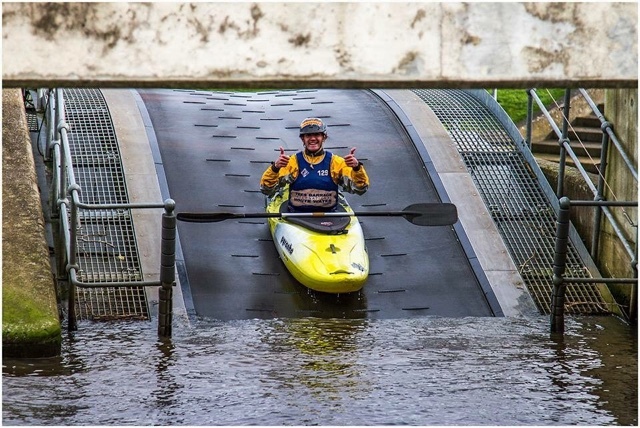 I probably wouldn’t have as many friends, as most of my friends are kayakers. KAYAKING LOVE, ITS A FAMILY AFFAIR. 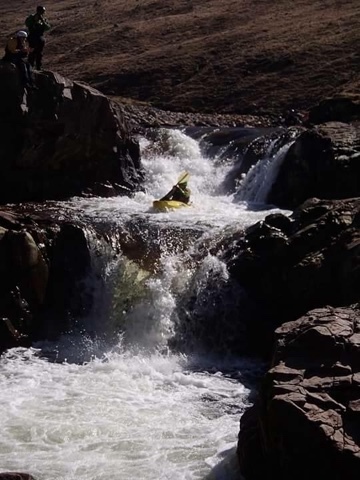 by Mayo Cross - DBP MAGAZINE ONLINE The World's Best Free Whitewater Publication.